Dress in a Makavelic soft warm hoodie and black sweatpants, if you feel like relaxed dressing without looking like you don't care. 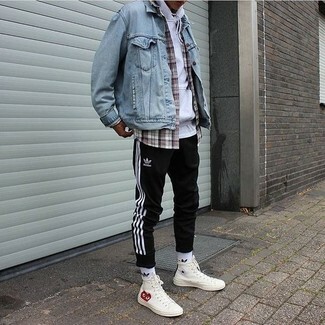 When it comes to shoes, this look is round off well with grey athletic shoes. 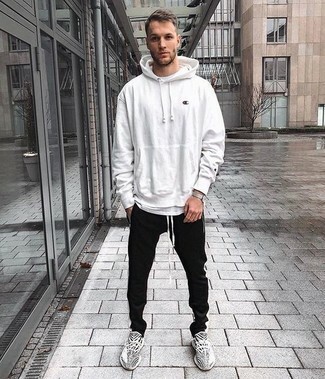 We're all seeking comfort when it comes to dressing up, and this combination of a white hoodie and black and white vertical striped sweatpants is a good illustration of that. White canvas high top sneakers will become an ideal companion to your style. 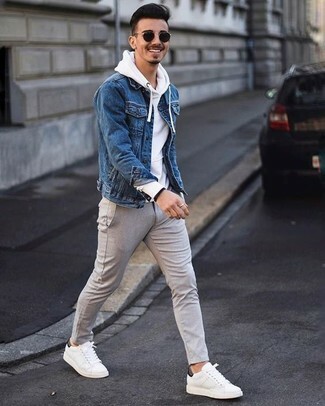 If you're a fan of relaxed dressing when it comes to your personal style, you'll love this stylish combo of a Makavelic soft warm hoodie and light blue ripped skinny jeans. 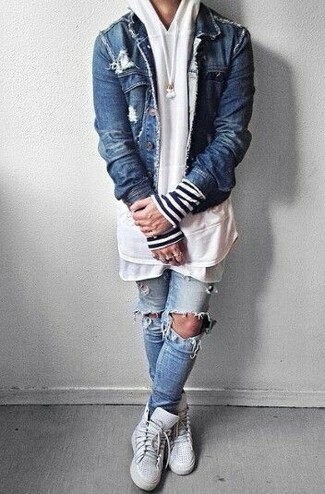 Kick up the cool of your ensemble by complementing it with white high top sneakers. 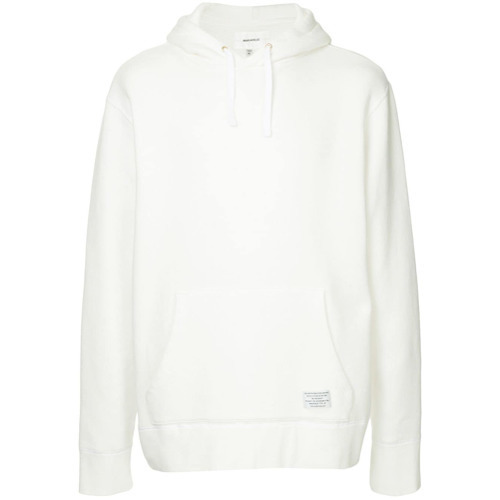 If you're looking for a casual yet on-trend ensemble, rock a white hoodie with olive chinos. These items are super comfortable and will look stunning together. A pair of tan high top sneakers brings the dressed-down touch to the ensemble. 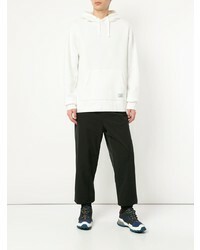 If you're scouting for a casual yet on-trend ensemble, opt for a Makavelic soft warm hoodie from farfetch.com and beige chinos. These garments are very comfy and look great when paired together. 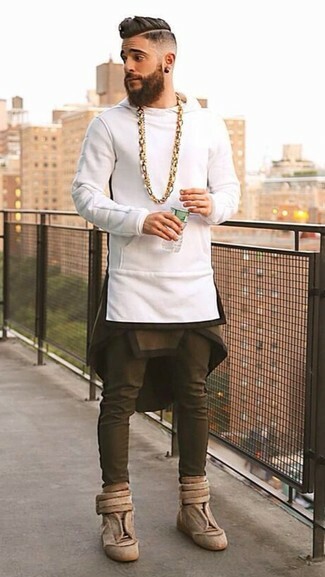 Finish off with white leather low top sneakers and off you go looking great. 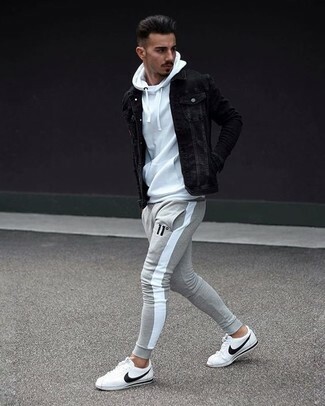 If you prefer functionality dressing when it comes to your personal style, you'll love this stylish pairing of a Makavelic soft warm hoodie from farfetch.com and grey sweatpants. Sporting a pair of white leather low top sneakers is an easy way to add some flair to your look. If you're after a casual yet sharp getup, reach for a Makavelic soft warm hoodie and white shorts. These two garments are very comfy and will look great paired together. Add grey plimsolls to your outfit for an instant style upgrade. 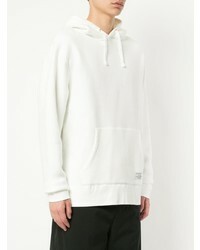 For a casually elegant ensemble, wear a Makavelic soft warm hoodie from farfetch.com and beige wool dress pants — these two items fit really nice together. If you don't want to go all out formal, choose a pair of white leather low top sneakers. 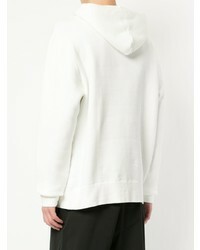 If you're on the hunt for a casual yet seriously stylish getup, make a white hoodie and blue jeans your outfit choice. These two items are very comfortable and will look incredible together. When it comes to footwear, this getup is complemented wonderfully with white canvas low top sneakers.